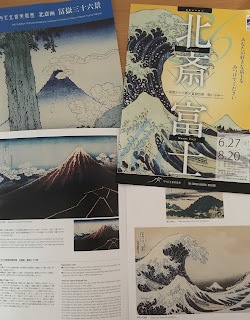 After reminiscing about last year's Mount Fuji climb in the previous post, I was spurred on to visit the Sumida Hokusai Museum (すみだ北斎美術館) which currently - ending August 20th - has a special exhibition elegantly entitled "HOKUSAI×FUJI - Thirty-six Views of Mount Fuji and One Hundred Views of Mount Fuji - A Towering Lineup" (北斎×富士　～冨嶽三十六景　富嶽百景　揃いぶみ～). The museum itself was opened only at the end of last year to honour the "world-renowned ukiyo-e artist" Hokusai (1760-1849) who was born and spent most of his life in Sumida-ward in North-east Tokyo. Hokusai is a timeless figure; he was the only Japanese listed among Life magazine's "The Hundred People who made the Millenium." The museum itself has a collection of some 1800 of his works, many of which are on permanent display, so don't worry if you missed the latest special exhibition (another special exhibition starts September 9th entitled "Hokusai the Performer"). The museum is housed is a strikingly futuristic building (above) designed by the award winning Japanese architect Kazuyo Sejima, winner of the "Nobel Prize of architecture," the Pritzker Prize, in 2010. 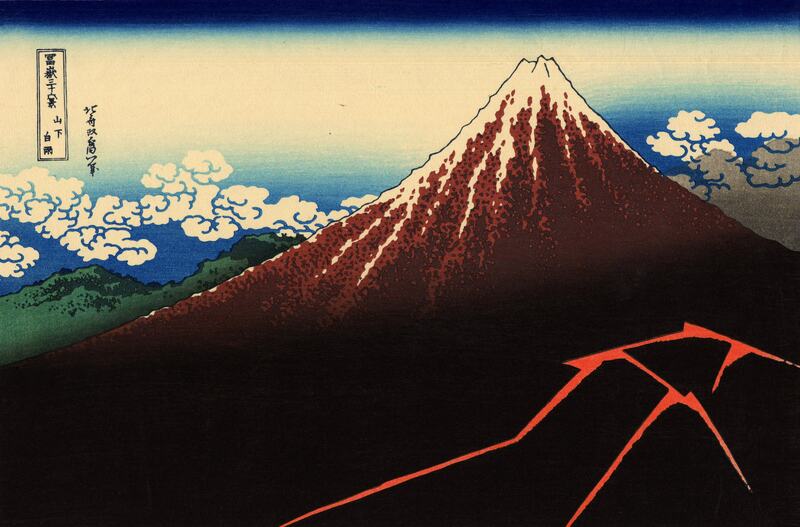 "Thirty-Six Views of Mount Fuji" - published around 1831 and later supplemented by a further ten images due to its popularity - is definitely the most well-known of Hokusai's works. The prints are actually created using multiple wood-blocks, made from hard mountain cherry (yama-zakura =山桜) trees with a different colour for each block. Mass production was possible through a three-step process: the artist (Hokusai in this case) draws, a carver cuts the wood blocks, and finally a printer prints each colour block to produce the prints. The museum has an amazing life-size model of Hokusai at work in his "studio" (house) when he was 84-years old (pictured left).